Epidermabrasion is a fancy term referring to exfoliating the skin using various methods. Exfoliating the skin or epidermabrasion usually involves using ingredients or devices to remove the top dead layers of your skin called the Epidermis. There seem to be different opinions on what type of ingredients can be used. A common one is pumice, some people even use sandpaper. If you think about it, Microdermabrasion (a machine that uses various types of crystals to sand blast the skin) could also be considered a type of epidermabrasion. I have also heard of chemical peels or skin peels being referred to as epidermabrasion because they also remove the top dead layers of skin from the face. However, if you are using a chemical peel to remove layers of dead skin it is a chemical reaction that is doing it versus a mechanical reaction. No matter what term you like to use, removing the top layers of the skin can be a good thing or a bad thing. Our top layer of skin is there for a reason. It is our skin's protective layer. So contrary to popular belief it is NOT a good thing to scrub your face to death or in my opinion even to use a scrub on your face every day. Some very accomplished skin care educators believe that if you over exfoliate your face you may actually be accelerating your aging process. I tend to agree with them. We know that inflammation of the skin causes accelerated aging so it just makes sense that this is an area that you need to be careful with. Any kind of epidermabrasion will also make you more sensitive to sun exposure so you have to be religious with your SPF use. That means you must use it daily (which you should be doing anyway). Why include Epidermabrasion in treatments? So what is all the epidermabrasion fuss about? Well the reality is that when you remove the top layers of the skin you are also triggering a healing reaction in the skin which in turn triggers cellular turnover. The skin feels softer, fresher, firmer, and has a glow. Manual and chemical epidermabrasion can also help improve acne, soften fine lines, and in some cases remove brown spots or discolorations from the face. I include epidermabrasion (different types depending on what is appropriate for your skin type) in many of my treatments. But you will find that even I won't let you get too many treatments and I insist you use anti-inflammatory ingredients and antioxidants during the healing process. Enzymes-A unique class of proteins that catalyze a broad spectrum of biochemical reactions. Enzymes are formed in living cells. One enzyme can can cause a chemical reaction that no other enzyme can. - Enzymes used in skincare such as papain (from papaya) and bromelain (from pineapple) digest dead skin cells gently. Almost every skin type will react favorably to enzymes. They have a natural softening effect on the skin. *Definitions taken from: A Consumer's Dictionary of Cosmetic Ingredients. 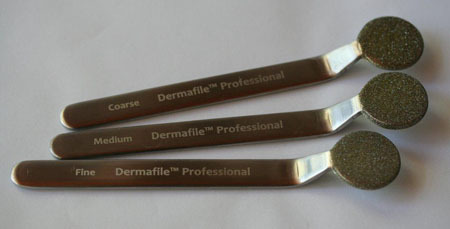 Dermafiles- Dermafile™ is a skin polishing and resurfacing tool made of stainless steel and finely crushed diamonds. This file will lightly polish the skin by hand, removing the top layer of dead skin cells, and leaving velvety smooth, fresh, rejuvenated skin. You have total control over the process, allowing varying levels of the epidermis to be safely removed. This tool may be used on any part of the body. It is a very effective tool for treating aging and sun damaged skin, scars, acne scarring, pigmentation, stretch marks, fine lines and enlarged and clogged pores. Dermafile™ is the perfect tool for back treatments. It will also smooth rough calloused skin on elbows, knees, hands and feet. Click here for more information. Dermaplaning or Skin Leveling- Dermaplaning (also sometimes called Skin Leveling) is a method using a sterile surgical type blade at a 45 degree angle to remove the fine peach fuzz hair and dead skin cells from the upper layers of the skin on the face. It is a great alternative to chemical peeling, although it can be combined with chemical peels for a deeper exfoliation. Click here for more information. High Intensity Treatments (ie: skin peels or chemical peels)- I call my skin peels, high intensity treatments instead. I prefer to do this because I have discovered that when you mention "skin peel" or "chemical peel" it strikes fear into many people. They have visions of the " Walking Dead" (do you love that show? Yes! Me too, sorry I couldn't resist! )....ok, back to what I was saying...many people are fearful about chemical peels. There are many types of chemical peels and they come in many strengths. I have lots of peels that will never actually make your skin visibly "peel". Peels can help clear up acne and can also be beneficial for anti-aging purposes as well. Visit me for a consultation and we will discuss peels more in depth. Sodium Chloride-Beside making food delicious, it's believed there are more than 14,000 uses for salt, and our grandmothers were probably familiar with most of them. A number of these uses were for simple things around the home before the advent of modern chemicals and cleaners. Many of these salt uses are still valid today and can be much cheaper and more environmentally-friendly than more sophisticated products. Most of these salt uses have stood the test of time. 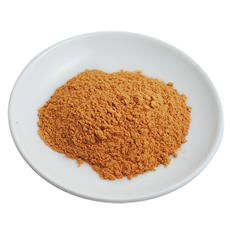 Salt is an excellent cleaning agent, either on its own or in combination with other substances. A solution of salt and turpentine restores the whiteness to yellowed enamel bathtubs and lavatories. A paste of salt and vinegar cleans tarnished brass or copper. A strong brine poured down the kitchen sink prevents grease from collecting and eliminates odors. A box of salt is also an important item in many bathrooms. In mild solutions, it makes an excellent mouthwash, throat gargle or eye-wash; it is an effective dentifrice; it is an effective antiseptic; and it can be extremely helpful as a massage element to improve skin complexion. 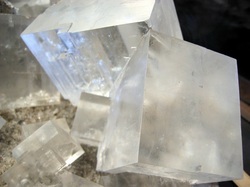 Zeolite Minerals & Jojoba Beads- Zeolite minerals are crystalline hydrated silicates from volcanos. Molecular cages trap and remove toxic pollutants trapping impurities. Jojoba beads gently scrub away dead cells. Jojoba is grown for the liquid wax (commonly called jojoba oil) in its seeds. This oil is rare in that it is an extremely long (C36–C46) straight-chain wax ester and not a triglyceride, making jojoba and its derivative jojoba esters more similar to human sebum and whale oil than to traditional vegetable oils.- Definitions taken from Skin Fitness and Wikipedia.